(Inside Science) – Sharp-eyed spectators watching Jordan Spieth play the first two rounds in his defense of the Masters championship might notice something unusual about one of his playing partners. At six feet one inch and 200 pounds, amateur Bryson DeChambeau certainly looks like a top golfer. But what differentiates him from the other 88 Masters competitors is the collection of clubs in his bag. Unlike his rivals', all of DeChambeau's irons and wedges – the workhorse clubs that advance the ball from the fairway to the green – have the same 37-1/2-inch length. Equally striking, all the metal heads of those clubs weigh the same amount, just under 10 ounces. Irons and wedges in a typical set of clubs vary from 36 inches to 39 inches in length and their heads from 8-1/2 to 10-1/4 ounces in weight. DeChambeau's unusual lineup has given him plenty of success. He won last year's U.S. Amateur championship, which earned him his spot in the Masters. And as a student at Southern Methodist University, he also won the NCAA's 2015 individual title. Only four previous players, Jack Nicklaus, Tiger Woods, Phil Mickelson, and Ryan Moore had achieved that double. The constant-length club collection and the "single plane" swing that it facilitates have significance beyond DeChambeau's Masters invitation. Weekend golfers who often find the game annoyingly difficult could also benefit from the unusual lineup. That's because they usually need a slightly different swing for each of the 14 clubs they carry. 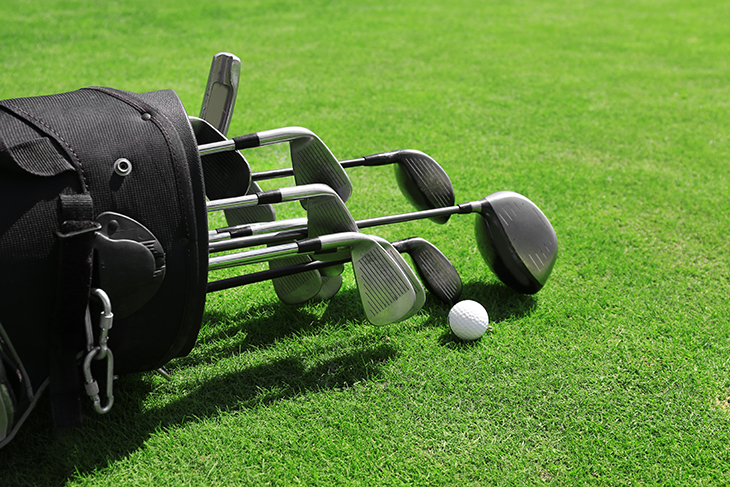 A typical golf bag contains three woods or hybrid clubs, ten irons and wedges, and a putter. Having clubs of the same length and head weight "is much, much more user-friendly for the average golfer," said Peter Dewhurst. A professor emeritus in theoretical and applied mechanics, and industrial engineering at the University of Rhode Island, in Kingston, Dewhurst is the author of "The Science of the Perfect Swing," published by Oxford University Press late last year. The technology has the key advantage of providing consistency to the golf swing. A conventional set of clubs requires a different ball position for each club. So each swing moves the golf club through a different plane. "Golf is one of the few sports where you use a whole bunch of different implements," said Steven Nesbit, a professor of mechanical engineering at Lafayette College in Easton, Pennsylvania. "So the golfer faces the challenge of being able to adjust from one to the other. DeChambeau has taken that out of consideration." In his hands, Nesbit added, "all the clubs have the same inertial resistance when he swings them. From the point of view of feel, every stroke feels the same." Consistency also stems from the fact that the ball lies in exactly the same spot with respect to the golfer for every same-length iron and wedge. "You are effectively playing every shot with a 7-iron, a club that most players can hit fairly well," Dewhurst explained. "Normally as you go with a longer club the ball gets further away from you." By contrast, having the ball in the same position for each iron shot allows the golfer to swing in exactly the same way, on the same plane, each time. Nesbit points out one disadvantage of same-length clubs. "For the lower number irons the club head velocity will be lower," he explained. "So you won't get as much distance from the long irons." According to Tom Wishon of Durango, Colorado-based Tom Wishon Golf Technology, a gifted player such as DeChambeau would likely hit his 37-1/2-inch 3-iron with six or seven miles per hour less speed than he would with the usual 39-inch club. "He would probably lose 12 to 15 yards in length," Wishon said. Average golfers would lose less, explained Wishon, who designs custom same-length clubs based on the length of an 8-iron. But they would benefit from the extra accuracy facilitated by the same-length technology. Another disadvantage occurs when a shot requires something other than an iron or a wedge. Hitting the ball with a wood or hybrid club could become particularly uncomfortable for a player familiar with the same swing for almost every shot. Nevertheless, DeChambeau and other users of same-length clubs need to use only four or five different swings rather than 14. Creating an effective set of same-length clubs requires some tinkering with clubs' loft – the angle that the club head makes with the shaft. The distance that a well struck ball travels depends on both the length of the club and the loft. To ensure that the longer traditional clubs yield longer shot distances, the clubs' lengths typically increase by half an inch for each transition from pitching wedge up to 3-iron. "To maintain the differential distance between same-length clubs," said John Spitzer, managing director of equipment standards at the United States Golf Association, DeChambeau's team "had to change the loft." According to Dewhurst, the team did that in a particularly canny way. They changed the loft increments, moving up from pitching wedges to long irons by five degrees apiece rather than the typical four degrees. "So DeChambeau's long irons have lower lofts to make up for the shorter shafts and the short irons and wedges have higher lofts to reduce the increased distance effect," Dewhurst explained. "Do this right and it's likely possible to have a set of single-length irons that still give constant distance changes between them." DeChambeau has added one further wrinkle to his irons and wedges. Because he holds his clubs with his palms rather than his fingers, he places wide grips around the top of his clubs. As it happens, those grips serve partly to counterbalance the weight of the club heads. Skeptical readers aware of the USGA's purported resistance to new technology might ask whether DeChambeau's clubs are legal under the rules of golf. Since he is playing in the Masters, they obviously are. "The fact that they're all the same length and have the same mass is not an issue," Spitzer said. "We have two limits on the lengths of a club: None shorter than 18 inches or, apart from putters, longer than 48 inches." DeChambeau differs from most other professional golfers in one other aspect: He majored in physics before leaving SMU short of graduation to pursue his golf career. He used the insights of that major in designing his club set in 2011. Working with his long-time coach Mike Schy, he jury-rigged the clubs from conventional 6-iron shafts. In his first try with the new set, he hit the 8-iron a respectable 160 yards. Then came the real tester: a 5-iron shot. That flew a spectacular 205 yards, he told a pre-Masters press briefing on Tuesday. At that point, he recalled that he told Schy, "This possibly could change the game." For weekend golfers watching the Masters on television this week, a high finish by DeChambeau could suggest a new way to change their own games.